On 1 April, Corporate Social Responsibility (CSR) Rules complete two years of existence. The two years have been a learning curve for all stakeholders. They have also seen an ever-increasing number of claims being made to funds available under the head. Given the level of interest, one would think that the corpus available under CSR is large. Nothing could be further from the truth. They are actually minuscule when compared to what the government spends on the social sector. From the Swachh Bharat Abhiyan and Digital India initiatives to the Indian Railways, every government scheme and ministry has been urging private companies to deploy CSR funds. “Everyone wants a share of the CSR pie without understanding the scope or spirit of the law," said K.K. Upadhyay, head of CSR at the Federation of Indian Chambers of Commerce and Industry (Ficci). The CSR Rules state that firms with a net worth of ₹ 500 crore or revenue of ₹ 1,000 crore or net profit of ₹ 5 crore spend 2% of their average profit in the past three years on social development-related activities listed in Schedule VII of the Rules. In 2014-15, the first year of implementation of the Rules, it was estimated that close to 16,000 firms qualified to make a contribution of about ₹ 25,000 crore to the social sector. 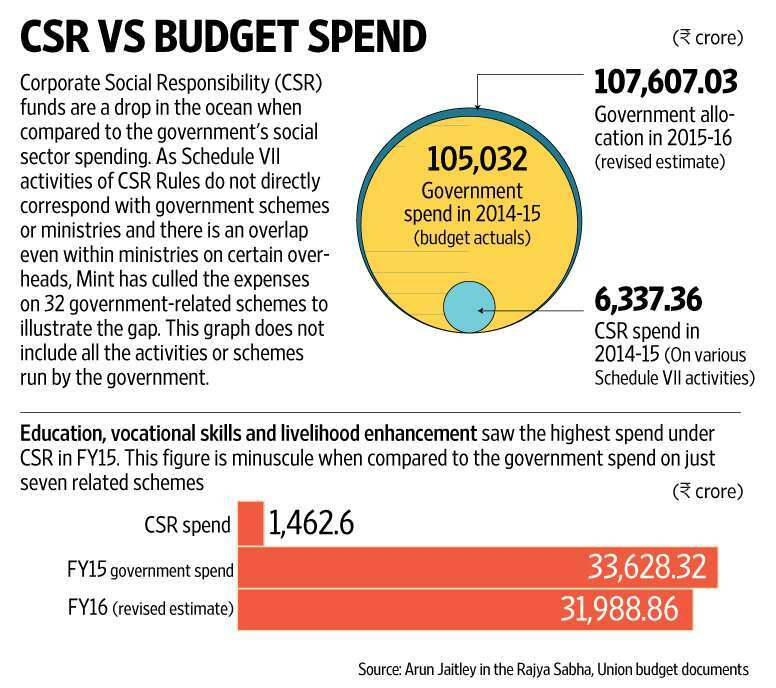 “Even this estimated amount only adds up to 0.4% of the total social sector spending of the Union government," Upadhyay said, suggesting that repeated calls by various government agencies for CSR funds is perplexing. In March, corporate affairs minister Arun Jaitley informed the Rajya Sabha that based on the CSR reports of 460 companies, a total of ₹ 6,337.36 crore was spent on CSR in 2014-15. That means just about 3% of the firms expected to spend on CSR had done so, contributing about 25% of the estimated amount. “The amount that the government spends on (social sector) schemes is huge. No donor money including CSR can make much of a difference to it," said Niraj Seth, director, advisory services at consultancy firm EY. Across just 32 social sector schemes, the government spent ₹ 1.05 trillion in 2014-15. Upadhyay said Ficci receives at least one request per week from a government agency or official wanting to know how they can attract CSR funds. According to him, the officials believe that this money can bridge the gap between government allocations and the needs on the ground. But a simple fact seems to be escaping everyone, he said. CSR funds cannot even begin to match the government’s budget, reach and scale. Then, there are other problems with government agencies seeking CSR funds. For example, if companies were to give money to elected members of Parliament (MPs), it could easily be interpreted as a violation of the law itself. The CSR Rules do not permit the use of such funds for political activities, a point emphasized by the corporate affairs minister himself. In March, Jaitley informed Parliament that “…no money of CSR can be spent for political activity. Schedule VII of the Rules specifies the 11 categories under which CSR money can be spent. If anybody is spending the amount outside that schedule, then it cannot be a legitimate CSR activity". Similarly, commercial entities such as the railways or oil marketers such as Indian Oil Ltd are seeking to use CSR funds. Oil minister Dharmendra Pradhan, in an interview to Mint, said he would like government-owned companies such as Bharat Petroleum Corp. Ltd to use their own CSR funds to meet the subsidy outgo on cooking gas. This is in direct conflict with the CSR Rules, which say that any activity that may qualify as “normal course of business" cannot be counted as CSR. The railway board guidelines issued in February facilitate the use of CSR money from other companies to upgrade amenities. This could set a precedent for other government-subsidized utility providers to seek money from other companies. Consultants and industry insiders such as Upadhyay believe that if companies start contributing to each and every government scheme, the spirit of the CSR law will be killed. “Companies should be free to decide and conduct CSR activities as they please instead of supplementing government efforts," he said. The law intended that private and public companies bring their expertise of innovation, management and efficiency to the social sector, he added. According to Seth of EY, it would be much more useful for companies to spend in areas where government resources are limited so that government expenditure and CSR spends of companies complement one another. “There is no point in spreading the resources too thin," Seth said. Bhaskar Chatterjee, chairman of the Indian Institute of Corporate Affairs, concurs. “The law is very clear on this aspect. It does not mention supporting MPs, MLAs or government agencies," he said. Having been a member of the CSR Rules drafting committee, Chatterjee believes that authorities can only guide companies regarding what to spend on.